To accomplish this in iPhoto, click on the View menu on top then choose Sort Events then check By Date and then Descending. This will show your events starting with the newest first. This iPhoto setting is very helpful when trying to visually identify your events. View --> Sort Events --> Check "By Date" --> Check "Descending"
Start with the first event and open it up by double clicking it, then do some cleaning. This means deleting bad photos and duplicate photos. To delete a photo hold Command pressed and then hit the Delete button. 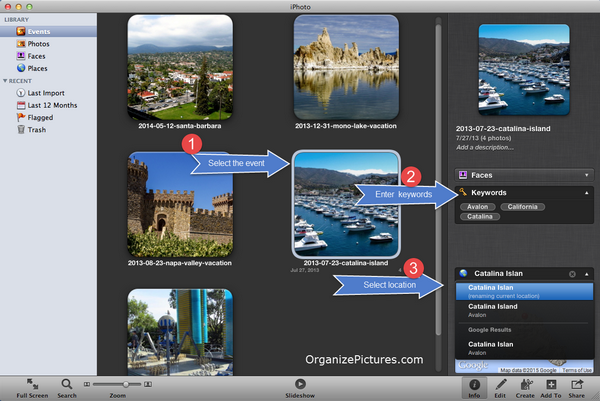 This operation will delete the unwanted photos from you iPhoto library as well. This is also the best point to add some efficient keywords for your photos in the events you have cleaned up. This will help you to visually identify your events and when you decide to export them the folders will have the correct names. A good event name is something like: 2014-11-27-moms-place-thanksgiving. The photo above shows you a few good event names on top and then some of the old “bad” event names left in iPhotos. Remember to rename events only after you have finished cleaning them up (delete duplicates and bad photos). While this is an optional step it is very useful and helpful in the future when you try to find specific photos in your collection. In order to add metadata to all the photos in an event, make sure you select the event and use the Info panel on the bottom right. In order to add any metadata (keyword and geotags), you must click the Info button on the bottom right tool bar. Once you click “Info” the right-hand metadata panel will be visible and you can enter your metadata. Now that you have cleaned your events photos, renamed your events and added keywords and geographic location, you are ready to export you photos from iPhoto to your hard drive outside of iPhoto. 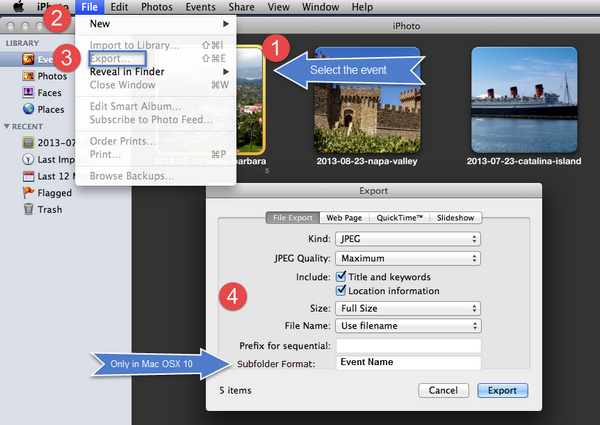 When exporting events from iPhoto, make sure to select the option to create sub-folder names from the event title. In addition, select the options to export title and keywords as well, so all the metadata you have created will be preserved inside the photo files themselves. This way you are preserving all the work you have put into renaming all the events. At this point however you have created two copies of the photos contained in the event you have just exported. It is your choice now to determine if you want to delete the event from iPhoto and keep only one copy of the event in your Pictures folder. If you are uncomfortable deleting photos from iPhoto and you have enough space on your hard drive, then you can keep both, but it will be difficult to remember which events you exported or not. iPhoto is slow, especially if you import many photos. My rule of thumb is to only hold one year’s worth of photos in one iPhoto library. Of course, you can import more or less photos, but one year’s worth of photos is a simple rule to follow. This brings more complications however, as you have to keep track of your iPhoto library files as you create them, and you also have to know where and how to store these library files. Reason being for above: if Camera Upload active and photos cut and pasted to My Pictures or Tranfer Folder … DropBox will ‘again’ upload photos that are on the phone (and since there is no photos remaining in the DropBox folder – I guess there is no mechanism for DropBox to know i t already downloaded the photos. I hope that is somewhat clear. I am just putting those steps in my Phone to PC process. The beauty is Dropbox storage limits are not pressed or compromised IF the photos are removed within a short time frame before more photos are taken with Phone. This sounds like a good way to automatically export photos from a phone. You do run into an old problem though…namely that you have to take the photos from your Dropbox folder on your Pictures and put it into your Pictures folder…just like you are saying….select all and cut and paste into My Pictures. Most of the times I connect my phone to my Master PC and transfer the photos straight to my Transfer folder inside My Pictures. Glad to here it works though. I am looking at using Google Drive for something similar. Solved the issue…thank you for letting me know!